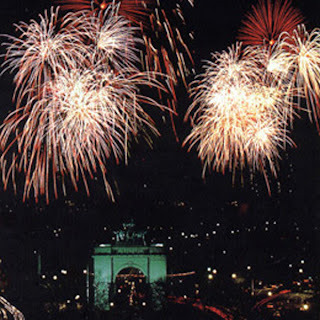 December 31 at Grand Army Plaza it's Brooklyn’s New Year’s Eve fireworks at midnight. The good viewing locations are anywhere in Grand Army Plaza, inside the Park on West Drive, and along Prospect Park West between Grand Army Plaza and 9th Street. The 3.3 Mile Fun Run around the Park starts at Grand Army Plaza at 11:15 p.m. More information on the run here. Holiday Tree Recycling January 5 & 6, 10 a.m. – 2 p.m.
"Bring your holiday tree to Prospect Park where we'll turn it into mulch for healthy ground cover. Watch your tree go into the chipper and take home some mulch for your yard or garden. Please remove all decorations from the trees." Tree drop off spots are Third Street and Prospect Park West and the Park Circle entrance to the park. Mulchfest, of course is a citywide event. You can click here to find all the Brooklyn locations on Jan. 5 & 6. The Sanitation Department will also recycle trees from January 3-16. More Mulchfest info as mulch time grows near.